Mark Sandomirsky a psychiatrist and doctor of medical science claims that he has found a simple technique that can help anyone get rid of the accumulated stress. He decided to make this public and showed the technique during a TV show on the Russian national television. There are many reasons why stress appears and stress can have different effects on your health and behavior. What people who are being stressed have in common is the unpleasant feeling which evolves into a feeling of heaviness or even pain that can occur in different parts of the body. One of the first steps to relieve this pain is to focus on your emotions and eliminate the negative thoughts. You should let them out (talk to someone). After that, you can focus on the physical effects. This is where psycho-reflexology comes into play. Each of us has several anti-stress points in the body and by massaging these points can eliminate stress and relax. Ancient Chinese as pioneers in this field, even have a special name for this point – The Gate of Heaven (Shenmen) – because after the treatment people feel pure energy going through their body. Shenmen can be described as a deep, hidden and incredible point that decrease or completely remove stress, encourage energy flow and improve your health in general. This is an acupressure point that can also suppress and heal inflammation, addiction and what is even more amazing is the fact that it can relieve pain anywhere in the body. 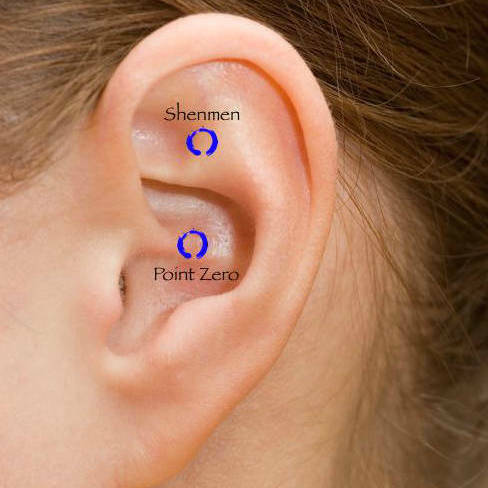 Shenmen point can be found in the center of the upper third part of the ear. Keep in mind that the main goal of this massage is to relieve stress. Use a cotton bud, press Shenmen point and start with a slow massage. Keep breathing deeply while you are doing this. Try to focus on listening to your body and continue to breathe deeply. When you exhale look at some point to the right and when you inhale look to the left. After only a couple of minutes, you will feel how your body is more relaxed and you will have a feeling of calmness. Some additional tips include massaging this point by using your own fingers and massaging it for a certain period, every time you are feeling stress. Repeating this technique before sleep will help you improve the quality of your sleep.